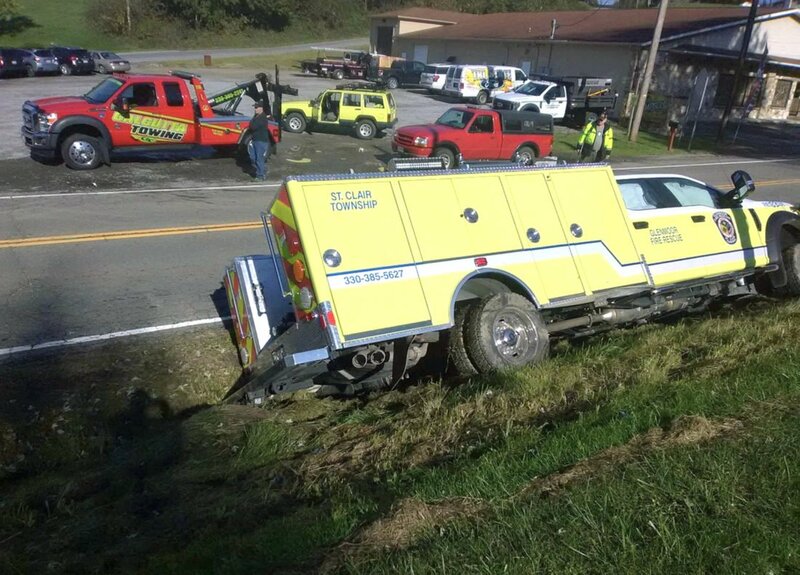 The newest of Glenmoor Volunteer Fire Department’s fire vehicles ended up in a ditch Tuesday while en route to a call, causing no injury to the firefighter who was driving but some damage to the vehicle. The 2017 Ford F-550 rescue truck was being driven by firefighter John Dear, who was responding to a medical call on Susan Drive to assist North Star Critical Care, according to Chief Bill Bennett. When Dear turned from Annesley Road onto Y&O Road, the truck suddenly entered a ditch, traveling several yards before going airborne across a driveway and landing on its side in the ditch. “He said he lost the steering, but I don’t know,” Bennett said about the cause for the crash. St. Clair Township Police were on the scene and kept traffic re-routed around the truck until it could be removed from the ditch by Southside Garage, Georgetown, Pa. and Calcutta Towing. Dear did not require medical treatment. Both airbags were deployed, and the truck had visible damage, but Bennett said the insurance company will have to assess the damage to the vehicle, which he said has only been in service since the beginning of the year. The police report was not immediately available Tuesday.